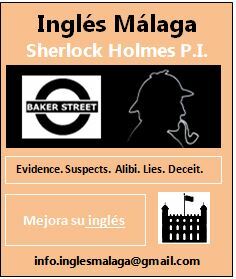 EVENTOS SOCIALES: INGLÉS MÁLAGA SHERLOCK HOLMES P.I. INGLÉS MÁLAGA SHERLOCK HOLMES P.I. 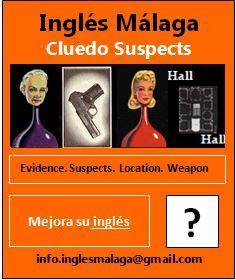 Inglés Málaga Cluedo Suspects is a murder mystery game which will test your English language skills. You will use your investigative skills, improve your vocabulary, and ensure that, at least, one murderer is off the streets of Málaga. Everyone suspects you. But, did you really do it? You are convinced that you were nowhere near the hall. Moreover, you have never even laid an eyeball on Miss Scarlet. And, as you are a little bit twisted, your weapon of choice would certainly have been a rope. Are the police officers complete nutjobs? Do you have the deductive powers and linguistic abilities to work out the clues, solve the murder, and prove your innocence? If you think you’ve got what it takes to be an Inglés Málaga Cluedo Suspect, and you want to improve your English communication skills in an entertaining way, why not take part in an Inglés Málaga´s Cluedo Suspect event? 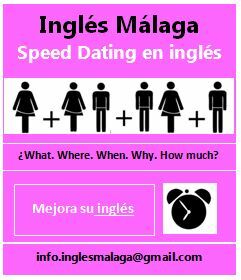 With the Inglés Málaga Speed Dating event there is no better way to practise your abilities to ask and answer questions in English. It is said that smart phones make smart people dumb, and dumb people smart. Would you agree? According to the popular film character Forest Gump, ”life is a like a box of chocolates”. So, with this in mind, are you a strawberry delight, or a chocolate toffee finger? How often do you talk about food, and say: ”mmmm…..yummy” when you eat?